I had some over ripe bananas so decided needed to make some banana bread. After the success of the Anzac biscuits from The Healthy Chef website I decided to give the banana bread recipe a try, you can find the recipe here. I ground my own almond meal and flaxseed in the Thermomix and set aside. You then whip up the rest of the ingredients like a smoothie on speed 5-6 for 20 seconds. I then added the almond meal and ground linseed and mixed for another 20 seconds on speed 5-6. The mixture pours into the loaf pan like a batter. I sprinkled the top with walnuts, cinnamon and some organic raw sugar before baking for about 60 minutes on 160 degrees celsius. I did oil and flour the pan but had some trouble getting it out and some of the base stuck to the bottom, think maybe needed to cool a bit more before removing from the pan. 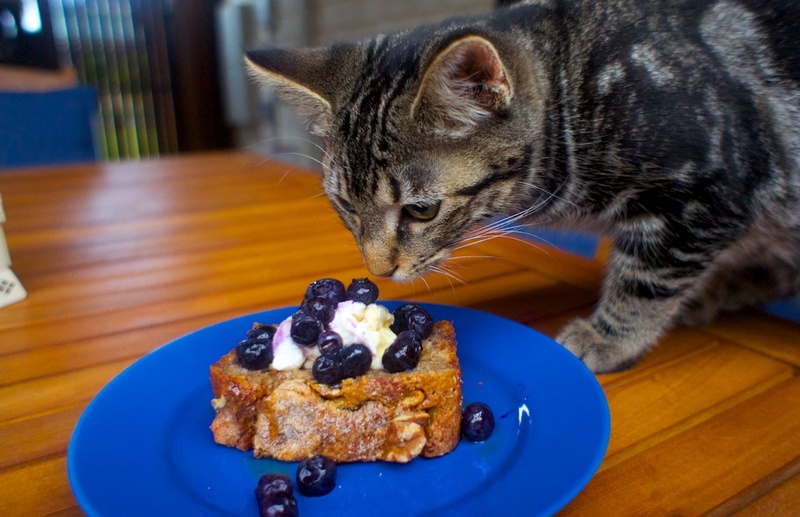 Served it with ricotta, blueberries and drizzle of organic maple syrup, made a delicious brunch with coffee, I think my cat Peppa agreed! Did you get a free kitten with it though? No, but that kitten is sooo cute! That is Peppa our latest cat!